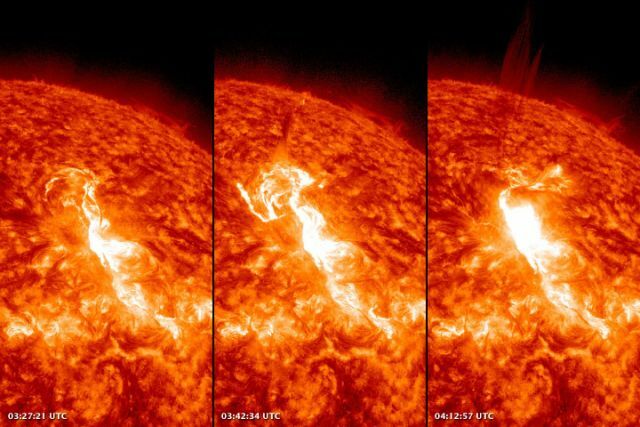 Solar flares on 23 January 2012: NASA images courtesy Solar Dynamics Observatory. After the quietest solar activity in a century, our star is flaring up towards a predicted solar maximum in February 2013. The photos above, taken only minutes part yesterday, show a flare of superheated and magnetically supercharged gas. In the third image (right), taken 45 minutes after the first (left), you can see the coronal mass ejection of a stream of solar plasma flowing into space towards Earth. The high-latitude solar flare was measured as M8.7 in intensity, just below the most intense “X class” of flares. The eruption sent a stream of fast-moving, highly energetic protons toward Earth, provoking the most intense solar energetic particle storm—an S3 on NOAA Space Weather Prediction Center’s scale—since 2005. 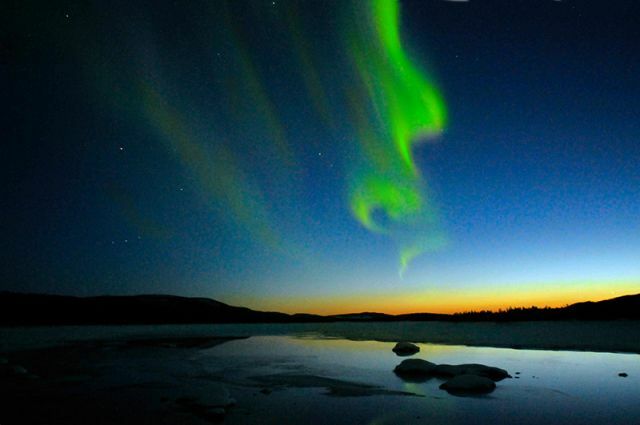 Northern light over Lapland, Sweden: Jerry MagnuM Porsbjer via Wikimedia Commons. Solar flares and coronal mass ejections can disrupt radio signals and electronics and satellite transmissions. But it gets weirder than that. Given exactly the right circumstances, they can facilitate enough geomagnetically induced current from the electromagnetic field to allow telegraph transmissions even when the power is switched off. Here’s where you might see an aurora. 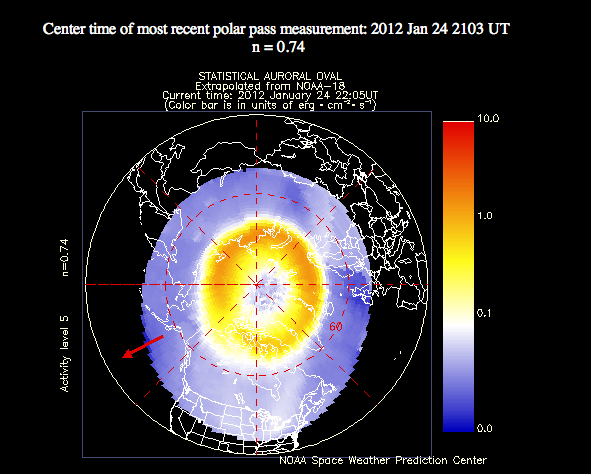 Current extent and position of the auroral oval in the northern hemisphere, extrapolated from the most recent polar pass of the NOAA POES satellite: NOAA. For those not fortunate enough to live in the high latitudes to witness aurorae for themselves, there are now loads of great video timeplapses online. This one has some particularly cool looking ribbon aurorae. AURORA ISLANDICA – a Northern Lights Timelapse from Agust Ingvarsson on Vimeo. And here’s a dry but informative video explainer, if you’re wondering exactly how it works.